A visit to the TRW demo just happened to have a 100mW laser and he beamed the laser into the fan blades during the demo. 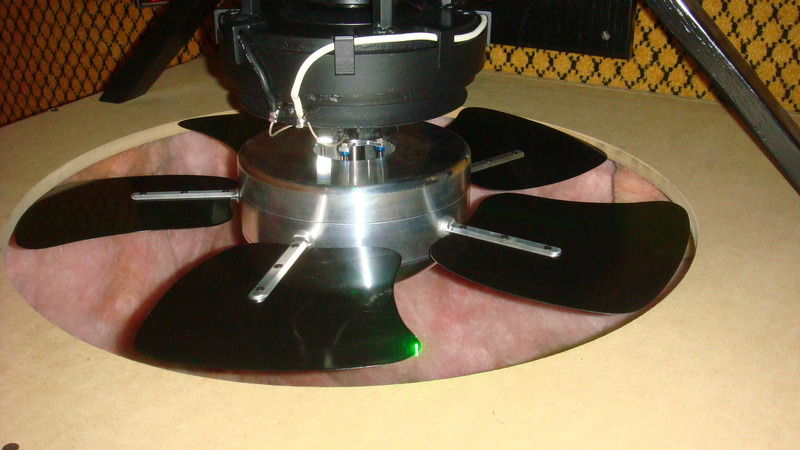 This had the unexpected effect of showing the amplitude of fan blade deflection as the beam would go from a spot to a line the length of roughly maximum blade deflection. If we could take that beam length and clock it out against a time axis, we’d reproduce the input signal perfectly. now for a couple of YouTube videos made during the same AES demo. 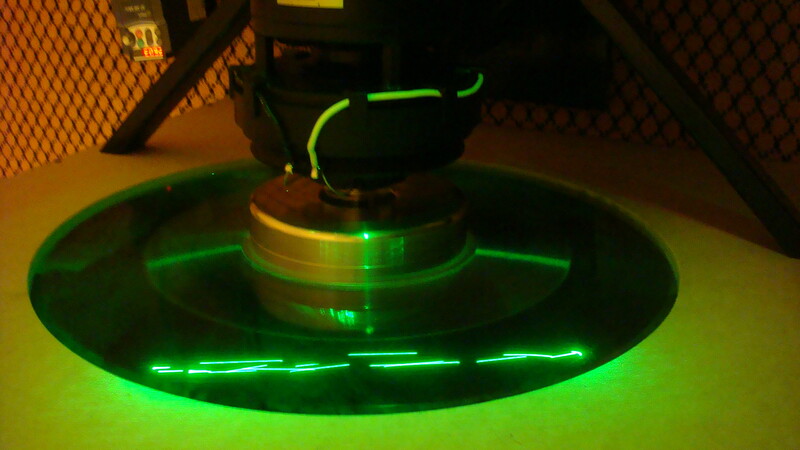 Notice the laser modulating it’s reflection against the moving fan blades. AES demo in San Francisco this weekend! at the AES show (http://www.aes.org/events/125/). I worked the booth for a few hours on Friday, helping them out since I am local and Eminent Technology is in Florida. They have a demo room outside the main convention center and a booth in aisle 1500 of the show floor. Bruce Thigpen and crew are at room 8051 of the San Francisco Marriott (right across from the Moscone West convention center building) … demos all day today 10-6 and tomorrow 10-4. Some great content including a Titan Rocket launch… you will walk out woozy! 1) a theme park up in Oregon where it simulates the sound effects of the Titan rocket launch referred to above. 3) the famous cathedral down in Wall Street. The pipe organ was ruined by the dust cloud of the Twin Towers demise. So they installed a keyboard organ with a signal fed to the TRWs to simulate the largest of the conventional pipes. They said they achieved 110dB in the middle of the cathedral with two units. Using the belltower as the back compression area… interesting. I am about to pull the trigger on a Integra 9.9 pre/pro to replace the Lexicon MC12B… the specs say that the analog bandwidth starts from 5Hz on this unit, so it should be fine for driving the TRWs. And I have been hearing good things about it from installers here in the Bay area. If it turns out to sound poor, I will just sell it on eBay and go try the Denon AVP next.